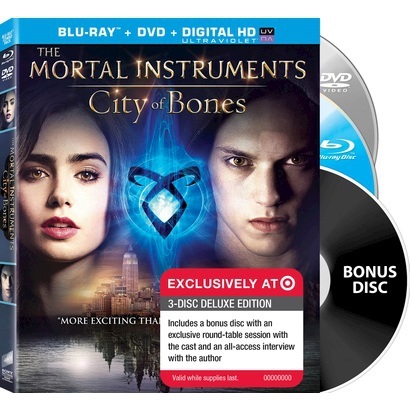 The Mortal Instruments: City of Bones hit Blu-ray and DVD in the U.S. and Canada on December 3, and now the numbers have been released. City of Bones was the fourth best-selling film in its first week of release in Blu-ray and DVD sales. The film, which hit No. 1 on iTunes in its first week, also ranked No. 8 in Blu-ray and DVD rentals. Be sure to pick up your copy to support The Mortal Instruments film franchise! It comes out over here in Australia today, I really wanted that Target special edition but sadly Target Australia doesn’t stock it.. In any event my mum’s getting my copy tomorrow night! By the Angel I’m excited! Yes! Hopefully this will be helpful for the franchise! I already know that`s in my stocking, but i`m counting down the days til I can watch it. You didn’t buy it yet? Why wait till xmas when you can watch it now. You haven’t read the Infernal Devices yet? Why wait when you could have read them already. I have read and loved the Internal Devices. The characters will fill your heart and will even make a lot of TMI more meaningful for you. I am actually glad I read TMI first and The Infernal Devices after. For me it was the perfect way to read the books and love all the characters. It was my favorite of all of them. The most memorable for sure. I got it first in my entire country that’s because I ordered it from the company and yeah of course I would buy it.